We were faced with the possibility that if we did not finish the pool before the rainy season we might negate the hard work that had gone into the excavation. The pool was essential to the success of the business we were setting up at Sky Hacienda, so we decided to go ahead with its construction. Firstly, we built adobe walls around the shallower part of the pool to act as forms for the concrete. We carved steps out of the earth to one side. We used stones on the bottom of the pool to reduce the amount of cement needed and to provide support for the reinforcing steel. The stones were laid out in rows and then the lines of reinforcing steel placed over them. The steps were given an initial concrete cap. Arming the steps with steel was a very labour intensive job. Each piece of steel had to be cut and bent by hand to form the correct shape. Every piece of reinforcing steel was wired together by hand. At last the pool was ready to receive the cement. We will pour the floor of the pool first. 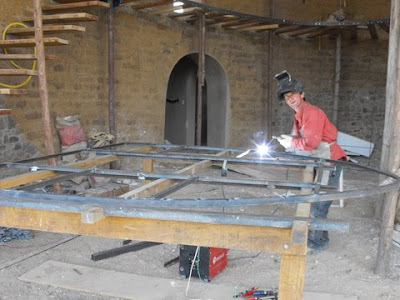 In the middle of November we moved into the single storey section of the Roundhouse. We had a roof, walls, floors we could walk on and windows. It was a bit bohemian - no internal doors, mattresses on the floor, a makeshift kitchen in the utility room, suitcases piled up in the wardrobe, and a lot of finishing still to do..... But it felt a hundred times better than living in the rented apartment in Sucre that had been our home for the past 18 months. And no more daily commuting! We had already decided that there would be no curtains at our windows. It was fantastic to turn off the lights at night and see the stars in the inky black sky and the moon casting shadows on the mountains. And as for the sunrises - beautiful shades of red and gold on the Andes and the sun shining through the bottles in the bedroom wall. Excavating the pool may have seemed premature, but it gave us sufficient earth to finish all the adobe floors in the Roundhouse. We needed to get the floors completed so that we could move into part of the house, instead of the daily commute from Sucre. The next layer was installed in each room and crosshatched to take the final finishing layer. 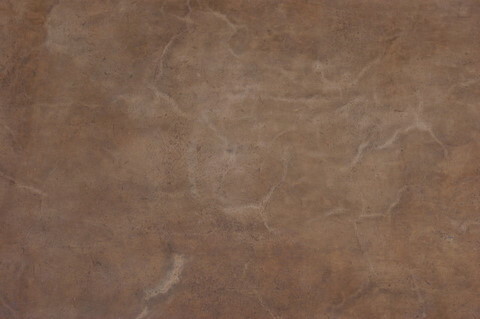 The final finishing layer was hand polished using a stainless steel float to remove any cracks. 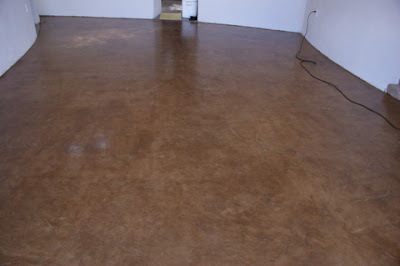 Ed had read up on this technique when studying polished concrete and it worked well with the adobe. 3 coats of boiled linseed oil were applied, all of which needed time to dry and then a coating of wax to seal and waterproof the floors. 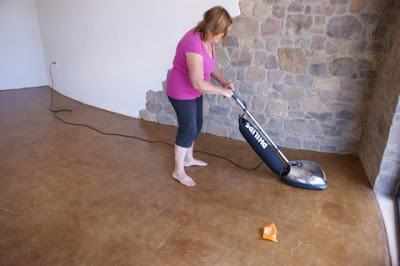 Luckily we found a floor polisher for sale in Sucre, which made life considerably easier. The final result was beautiful - like old shiny leather. Our new floors were so comfortable to walk on with bare feet and so warm. It had been a lengthy process to achieve the finished effect, but well worth it. With the floor dry, we needed to quickly move on to pouring the walls of the pool. Our men were taking their annual summer holiday from the 16th December until after the New Year and we wanted to finish the pool in time for Christmas. We lined the walls with wood then braced them with eucalyptus posts. Again, re-inforcing steel was used to strengthen the walls. On the right of the photo you can see the wheelbarrows lined up to take the cement mix to be poured into the walls. The pool steps were a little more complicated, requiring forms made of thin plywood to hold the cement in place. The finished steps looked amazing - sharp and smooth. Our design combined the features of a lap pool with a sitting and cooling off area to the side for our less energetic clients. It only remained for some final trowelling out of the rough edges. Our maestro, Geronimo, was rightly proud of the finished product. He and his team had worked hard to get the pool finished. Armed with their traditional gifts of Christmas food baskets they left the site for a well-deserved holiday with their families. We decided to choose metal frames for our windows, to provide a contrast with the fluid adobe walls of the building. 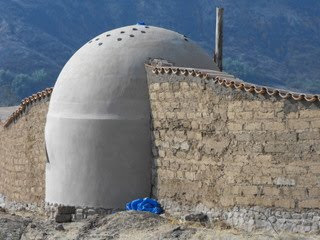 We found an artisan builder in Sucre whose work reflected the quality we were seeking. 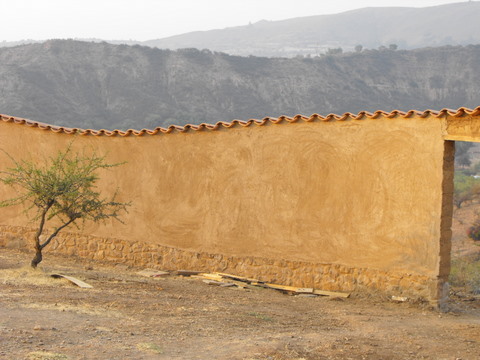 The thick adobe walls gave us the flexibility to install the flat window frames. Once glazed the windows looked better than we had envisaged. We particularly liked the way the view from one side of the main bedroom to the other and beyond was framed. Now the build was really moving! We continued creating terracing around the house to protect the foundations ahead of the rainy season. The stones are collected from the land and sorted to provide a level surface before being covered with reinforcing steel and then concrete. The terrace is designed to follow the contours of the land, whilst channeling water to drains. A view from the back of the house where water is already being channeled from the upper terrace to the gully below. For now the terracing ends at the main entrance and will be completed once the pool is finished. 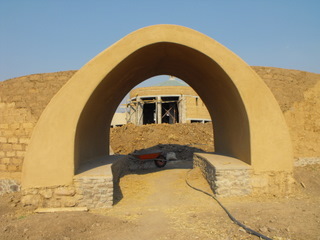 The adobe archway forming the main entrance is finished. 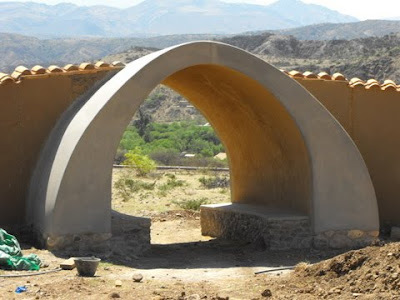 We decide to put a thin cap of cement on the outside of the arch to protect it from heavy rain. The inside of the arch is left in its raw state so that the earth can breath. 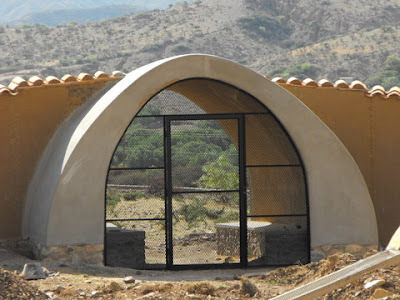 ...and we have a beautiful gate to complete the main entrance. We top the walls around the garden with tiles - a vital action to prevent rain damage. 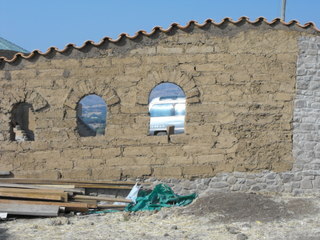 The walls are then rendered to give a strong finish.